On the lecture tour of America in 1882, Oscar Wilde came in for much ridicule. Here we see how he was conflated with Jumbo, the circus elephant. First in a simple advertisement trade card, and then in a more subtle satire in Punch magazine. Wilde was often the target for the sophisticated wit found in Punch magazine, and when Wilde left for America there appeared a fake interview with him, at the centerpiece of which was a cartoon entitled Ariadne In Naxos, which we analyze here. It is a major focus of the web site to provide a collaborative and definitive itinerary of Oscar Wilde’s lecture tour using modern research techniques. The verification of the lecture tour has now reached Chicago where Wilde met department store founder Marshall Field. 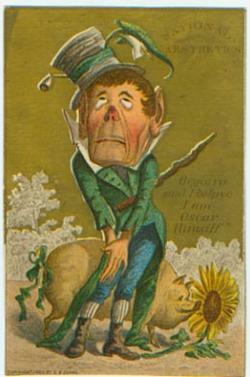 Oscar was also featured in advertisements for various products, typical with trademark lilies or sunflowers. Here we see a leprechaun aesthete. Preposterously Puffed Pachyderms is a line from this article in Punch that continues the satirical conflation of Oscar and Jumbo.